Desert Racer: Peroneus Bravis, ouch! This week has gone well, all up until Saturday. On Tuesday I did a 10k trail route. I had hoped last week would be my last head torch run, but starting at 6:30pm it was already dark so once again I headed over the local fields and woods by torch light. I'm always hopping over stiles on the routes I run, some areas near my house being quite rural. If you are reading from abroad and have no idea what a stile is, don't worry I'll explain later in the post. Anyway, for once I counted how many I had to negotiate in the 10k route. 17! Even I was shocked at that. The route is pretty typical of the ones I run most days too. I did start the run wearing a hat and gloves, but soon took them off. It was warmer than I thought. Not long after I ended up removing my windproof jacket and putting it around my waist as I got too warm for even that. After the run, I went to my 1.5 hour yoga class. No toes touched yet, but I will let you know when I can manage it! On Wednesday I did another 10k trail, but this time arriving home with just enough daylight to see, so no torch required. I chose one of my favourite routes; a challenging woodland trail with some steep ascent and ankle-twisting paths, the woodland floor littered with exposed tree roots. May sound a little risky to be deliberately choosing such tricky terrain this close to the Atacama Crossing, but I know the ground well and it keeps my mind sharp, scanning the ground ahead. I have also built up good ankle strength over the last few years with specific exercises in my core stability workout. I wore my knee brace again this evening, after my patellar tendon felt sore. It has flared up a little again, but it's not too bad just yet. Both Tuesday and Wednesday routes had around 7-800ft of ascent and were very uneven. On Thursday I drove to the gym, warmed up for 10 minutes as usual then went outside and ran my 3 mile tempo run on the road. Last week I ran it in an average 7:20 minute mile; well down on my best. I failed to start my GPS this time, but judging my the overall time the route took me, it looks as though I managed to shave 3 or 4 seconds per mile off that time. A small improvement is better than nothing at least. I did a solid hour core strength and stability work in the gym afterwards, and then 15 minutes in the 80C sauna. In the week before I leave for Chile I will once more use the sauna nightly. I typically do 3 x 15 minute sessions each night, with a 5 minute cool-off in between them. I do this because there is anecdotal evidence that it ca help to acclimatise to a warmer country; increasing your sweat rate and reducing the amount of salt that you secrete. I don't know if it works or not, but it can't really do me any harm can it? Friday, I rested, and then on Saturday planned a 12 mile trail route. I added 5kg of weight to my racing backpack as well. The first time I would run with that much weight since taking part in the Kalahari Augrabies Extreme Marathon back in September 2008. The route would take in 1300ft of ascent and a mix of terrain. I started, as all of my training runs do, with a mile on the road, gaining a couple of hundred feet. I then cross my first stile and head up over fields to a local Cleopatra's needle style landmark called the Wedgwood Monument, built to honour a local mining colliery owner at his death. It used to be 20M high, but a storm in the 1970's blew it down. It was put back up, but now stands just a quarter of it's original height. I took this photo from the top of the hill, with view looking across Staffordshire and into Shropshire (there's probably a little Cheshire in there too!). You can see some off looking earthworks in the photo. The area I was standing on was right on top on an old colliery, over 150 years ago, so I guess that it was something to do with that. I then ran down the other side of the hill. I took this shot looking back up; you can just make out the monument at the top. I turned back to continue the route and took a photo of a stile for those abroad who have no idea what I am talking about when I keep mentioning them. If you read the stile Wikipedia entry they do appear to be a UK phenomenon. They allow you to cross between fields, without letting any livestock escape. Cows and sheep haven't yet learned to climb these. I still trip over the odd one, so neither have I it appears. They come in all sorts of shapes and sizes, just keep me on my toes. I then cross a high bridge over a long-abandoned railway line; a line that used to link the many mines in the area. I then hit a road, for a 3/4 mile stretch on a narrow country road. Then I join that very same abandoned railway line, but a 2 mile section of it has been turned into a cycle path now as you can see below. So, nice easy flat running for 2 miles before then crossing another road and coming into the old Minnie Pit area. These small monuments there, tell their own sad story. Minnie pit has long gone, the area returned to nature. It looks much prettier now than it did back then, I am sure. The area has been turned into a nature reserve, with a lake and some pathways, even a bridal way for horses too. I ran through there for the next couple of miles, before heading up a fairy mucky country lane. I wish I would have taken a photo 100M further back, as I had to run ankle-deep through liquid silage. The things I do for my art eh? There are a few brief seconds when I wished I lived in London and could trot along the manicured paths of Richmond Park for training runs. However, I quickly come to my senses and realise just how ill prepared I would feel to take on these extreme challenges if I only had nice paths and tarmac to train on. I'm lucky to live where I do I think. The mucky path later turns into a much nicer one though. However, there was a lot of bricks and rubble buried on that road, probably to fill in pot-holes to make driving easier. It was along this stretch that I started to get foot pain on the outside of my right foot. If it wasn't for the fact I knew exactly what the pain was, I would have been very concerned. Now at around the 7.5 - 8 mile stage, the pain began to get worse, but it was manageable. The route emerged on a busy country road and I ran down it for 1/4 mile. I then tried to turn into a familiar footpath around the site of the old Silverdale Colliery, but it the foot path had been fenced off and closed. It looks like they are building houses on it. There was a notice up announcing the temporary closure (probably for a few years), and that there was no path diversion. So, now at the 9 mile stage, I had to backtrack and follow an earlier footpath, before crossing some access land (well, I hope it was access land) and rejoining my planned route. This tagged an additional half mile and more ascent onto the route. There are a few fierce climbs between 9 and 11 miles, but running on my toes, as you do when running uphill actually eased the foot pain. This was confirmation of the self-diagnosis I had already made. I then headed into Apedale country park for some final undulating terrain and joined a road for the last mile home. I ran 12.5 miles, at an average of 6.1mph, so just faster than 10 minute miles. Not bad considering I was wearing the backpack. I stretched out as I usually do, and took my trainers off. I couldn't put the flat of my foot on the ground it was so painful (and still is). I can walk on my tip toes fine, on the right foot, but not the sole. I have had this pain a couple of times, and only once as bad as this. The first time it happened I swore I had fractured my foot. I was almost sick with the pain, and actually went and had an x-ray done at Accident and Emergency. They even gave me crutches, even though there was obviously no break. After researching and getting the same problem again, including a milder case during the Kalahari marathon I know what the problem is. It is acute inflammation of the Peroneus Brevis. Here's a picture to illustrate. 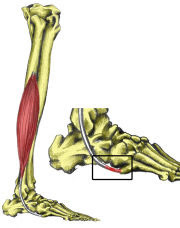 The tendon runs down the lower leg and attaches to the fifth metatarsal. It attaches just behind that little lump half way down the outside of your foot, and it is precisely there where the pain is felt. This is a fairly common running injury, and those that have had it will testify how much it can hurt. It is now a day and a half later, and I still can't walk properly; only moving around on my tip toe of that foot. I have been icing it frequently, and apart from rest and some anti-inflammatory medication there isn't a lot that can be done. I can have some ultrasound on it, but chances are by midweek it will have settled down. This is why I am not too concerned. It is pretty unpleasant pain, but I've had it before and I know it will go away by itself. I may not be up to running on Tuesday; we'll just have to see. I suspect a combination of the very uneven tracks I have run on this week, along with wearing some actual trail shoes (less cushioning), and the 5kg pack have conspired to inflame the tendon. Stony ground always sets this injury off with me. This is one reason I am dreading the razor sharp uneven salt-flats in the Atacama Desert. It is pretty much a given that this injury will reoccur in Chile. It is just a question of how bad I get it. I can't run 100 miles on one tip-toe (it messes up your whole running gait of course), so I hope I don't get it this bad. So, other than this little hiccup it has been a successful week. I hope to enter the 30 mile hill run/walk next Saturday, but it all depends on how this foot heals. Sounds painful Rich, but at least you know what it is and how to deal with it. Hoping for a full recovery very soon! Is it the Starkeholmes Stagger you are thinking of next weekend, I am considering that one too, done it years ago and it's a good route. Hi Steph. I'm doing the 30 mile 'El and Back on Sunday, then either 24 mile Trollers Trot or 21 Grindleford Gallop the next Saturday (14th). Starkhomes stagger is on the 21st. That's a bit to close to the event for my liking. I fly out on the 25th.